I originally wrote this on 9 August 2008. Thought I’d dust it off and share it with y’all tonight. I had the great joy today of going to the movies. I haven’t been in over two years, so I was very excited and maybe a bit nervous that I pick just the right one to see, as it could be another two years before I get to go again. Wow. Prices have changed, but little else has. The smell, the lights, the movie posters everywhere. My friend, who blessed me by asking me to join her, led me to the right popcorn and coke line, where we got our small sizes of each. We headed to the theater where the lights had already dimmed and the “Please turn off your cell phone” message was playing. We found our seats and I settled in—here I am—entertain me! As the previews began, I was mesmerized. The first movie, hmmm, not so much. I don’t remember the title. I just know it won’t even make my “hey, let’s watch this on TV” list. The next two, though, seemed to be full of energy and action, with plots that would keep one laughing, crying, and wanting more. I was amazed that the producers could put together just the right clips to make me want to come back for more…..tomorrow…..I don’t want to wait two more months! As the theater darkened, getting ready for the feature movie, I sighed. I love the previews. I could have gone home happy then. I know so many people who groan and moan about the previews on DVD’s and how they can’t just skip over them. I must confess—were it just me watching—I would let them play, taking it all in, even if it was for a movie I’d already seen. 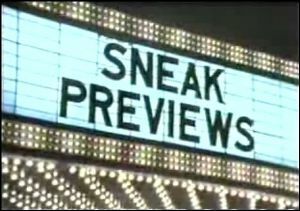 I love the previews. The movie started, and it hit me how some of the best moments in my life have been previews. The first time I saw each of my three children—what a preview! A tiny little tadpole looking critter, whose only indication of life was a microscopic little heartbeat that brought me to tears. They each had other previews, later sonograms…..and maddeningly enough to some folks, I turned my head during the most crucial time, so I could be surprised when they actually made their opening scene. Did I mention I really love it when they don’t show all of the best scenes in the previews? Previews that leave me giddy with anticipation and wondering? Yes please. When each one took her/his first step, it was a preview of the times they’d run to me with open arms for a hug, turn away from me in frustration, or leave me behind for their very first “all by my big self” adventure. When each spoke his/her first word, it was a preview of all they would share—the “I love you,” the “I can’t stand you,” the “you’re the best, Mama.” When each dressed him/herself for the first time, it was a preview of the self-expression that makes each one so unique and precious and treasured. Each day with each one is a preview of the people they are becoming, with every moment and with every breath. When I first met the man I would marry and he held my hand, I had a preview of our life together—someone who would listen, someone who would walk beside me and share the journey, someone who would offer a hand—a hand up, a clap to cheer me on, or a hug when I need it. At our wedding six years ago, I had a preview of a friendship that I would come to treasure. Never would I have guessed back then that the person whom I had only briefly met, who gave so selflessly and took it upon herself to set up and decorate our reception area would, six years later, be sitting next to me in a dark theater, laughing and literally “rejoicing” with me over a movie that we both so connected with. Our world gives us previews too. The first flower that pokes its head up through the soil gives us a glimpse of the spring and summer to come. The first blossoms on the peach trees leave us anticipating that first bite into the first juicy, ripe, sweet peach of the season. The first cool morning towards the end of a sweltering summer gives us a preview and a reminder that fall will come. The clouds and brisk winds brings to mind the precious rain that will fall down and nourish our earth. Some plots are too good to be improved upon. Previews. What is to come for us. The little things that make us come back for more—to seek more–and the delightful surprises that play out when we do. That’s what is so wonderful and mystical about this life. We are constantly getting previews of the good things to come. Sometimes we just have to take a moment to sit quietly and look around. And then get ready—the best is yet to come!